Have you tried lymphatic drainage? 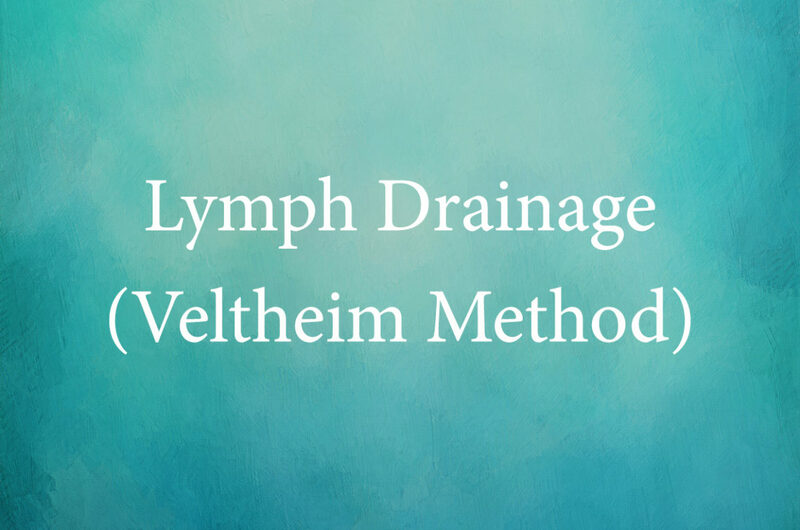 Veltheim Method of Lymphatic Drainage (VMLD) is a highly effective way of moving interstitial fluid through the tissues and into the lymphatic system. And, since the lymphatic system is intimately associated with the immune system, the immune system’s functioning is also improved with VMLD. The proper functioning of the lymphatic system is critical to our body’s ability to detoxify and regenerate tissues. The lymphatic system filters out toxins and foreign substances, recovers crucial substances that have escaped from the blood and helps maintain a healthy immune system. Unlike the circulatory system, which uses the pumping action of the heart to circulate the blood, the lymphatic system relies upon hundreds of tiny muscular units called lymphangions to contract throughout the body to propel the lymph. The lymph can then eliminate waste products. When the action of these tiny muscular units is hindered, this can lead to the stagnation of lymphatic circulation. If the lymph circulation stagnates due to injury or infection, toxins accumulate and cellular metabolism is significantly compromised. The result is an increase in acid and toxins within the tissues causing pain, tension, and edema. These substances along with the edema need to be removed quickly from the interstitial fluid in order to promote proper tissue healing and restore proper pain-free movement. The lymph drainage procedure involves using flat hands and all the fingers to simulate gentle, specific wave-like movements. These subtle manual maneuvers activate lymph and interstitial fluid circulation as well as stimulate the functioning of the immune and parasympathetic nervous systems. With lymph drainage, there is immediate and marked reduction of acute and chronic edema and hematomas, post-injury and after surgery. There are over 12 quarts of lymph fluid compared to only 3 quarts of blood in the human body. This lymph fluid moves approximately 45% of waste through the body as it helps drain debris from 17 glands and organs. Toxicity is the state of sluggish lymphatics. VMLD assists, on a physical level, in dealing with conditions such as acute swelling around an injury site and chronic edema, as well as pain inducing chemicals and hormones that are stagnant. It is amazing types of dramatic changes that can be observed just by helping the lymph flow through the area.